A comprehensive engineering analysis was performed on a coke oven battery roof and heating walls. Coke oven batteries are constructed with refractory bricks. To accommodate thermal expansion that occurs in the bricks when they are heated from ambient temperature, expansion joints are used. These expansion joints are then sealed with grout after most of the thermal expansion has occurred. Premature grouting of the roof was a major consideration in evaluating the structural integrity and projected life expectancy of the battery. In litigation, it was alleged that longitudinal expansion of the roof due to the timing of the grouting had caused the top of the heating walls to move away from their straight vertical positions, inducing excessive stresses in the heating walls, thus limiting the structural integrity of the battery. O'Donnell Consulting (OCE) was tasked to perform a comprehensive engineering analysis of the grouting sequence and to evaluate the structural life of the battery. OCE made extensive use of finite element engineering analysis to calculate temperatures, deflections, strains, and stresses using time-dependent creep analysis methods to evaluate the long term integrity of the roof and heating walls. When in operation, coke oven batteries normally undergo time-dependent deformations, and creep, due to static and cyclic thermo-mechanical loads. Using finite element analysis methods, evaluations were carried out for a 25-year operating life. Conservative values for the material properties, allowable stresses, and modeling details were used when performing these evaluations. Material property tests were performed on brick-only and brick-mortar specimens obtained from the original battery production lots. Data from the tests, which were performed at a range from temperatures from ambient to 2200 oF, were used to generate values for allowable design stresses. 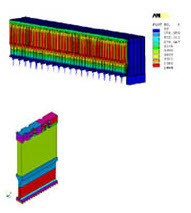 OCE performed finite element structural analyses of the battery using the allowable design stresses and refractory material properties. Three dimensional, non-linear models were developed to quantify the stability of the heating walls and evaluate the wall stresses. These models were subjected to cyclic pressure and thermal loading conditions, due to charging. The effects of operating conditions on the as-built battery with construction imperfections were evaluated to determine the battery displacements and stresses vs. time. The finite element results showed that the battery oven walls would not deflect enough to induce instability. The construction imperfections had no meaningful effect on the structural integrity, robustness, or longevity of the battery. Such studies are quite useful in planning battery maintenance efforts. O'Donnell Consulting Engineers, Inc. (OCE) provides engineering, failure analysis, metallurgy, and expert witness services. Providing analytical, design, testing, and technical problem solving services for more than 30 years, our extensive experience gives us credibility in expert witness testimony. Our results are based on quantified engineering principles and analysis- not just opinions. We have testified in International, Federal, and State Courts, presenting comprehensive technical reports, models, and simulations that are easily understood by Judges and Juries.